And as a phantom scares the wind. Oficina Chacabuco at present. It was Declared Historical Monument on July 26, 1971. It is located in kilometer 1,470 of North Route 5. It can be visited every day of the year. Anonymous. 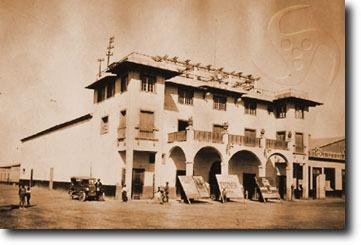 Theater of Oficina Chacabuco (c. 1929). Part of the building corresponding to the Philharmonic hall is observed on the right. 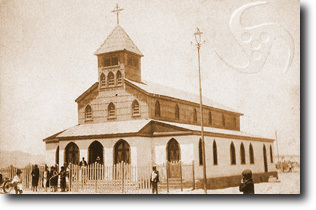 Oficina Chacabuco is located in the Central Canton of Antofagasta and was constructed between the years 1922 and 1924 in the lands of the former Oficina Lastenia, with a cost of one million pounds sterling. 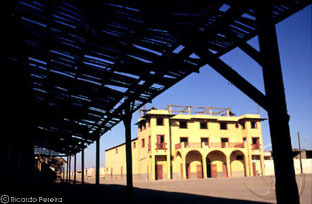 It was inaugurated in the year 1924 and stopped its activities definitively in 1940. 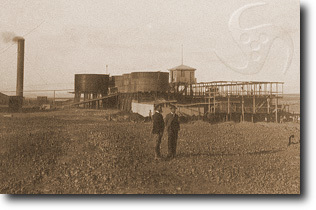 Its owners were Anglo Nitrate Company Limited and subsequently Anglo Lautaro Nitrate Company, represented in Antofagasta by Baburizza, Lukinovic & Cia. It was the last Nitrate Oficina implemented with the productive system called "Shanks". It stood out in addition for its great size, productive capacity 150,000 metric tons of nitrate and 922 metric quintals of iodine per year) and the quality of its installations, both industrial and living quarters. 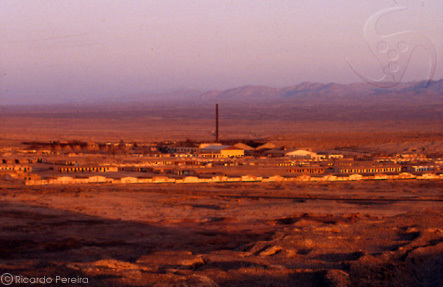 In the year 1968 Anglo Lautaro Nitrate Company sold Chacabuco to Sociedad Química y Minera de Chile (SOQUIMICH) that maintained the property of this Oficina until 1972, year when it was occupied by the Armed Forces. Anonymous. 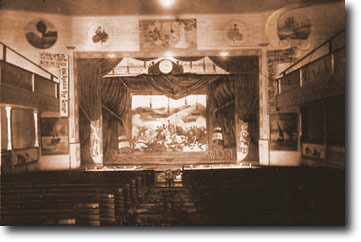 Inside the Theater of Chacabuco. The Library was in the second and third floor. Part of the Chimney and Workshop. This Nitrate Oficina was implemented with the most modern plant for the production of nitrate under the Shanks system. At present its installations of Machines and Camp are in a regular state of preservation under the tuition of the Ministry of National Property in the capacity of National Monument. In 1971 Oficina Chacabuco was declared National Monument, in the category of Historical Monument, as a way to preserve the testimony of what was the industrial development of nitrate in Chile and the way of life of the times. It is for this same reason, that between the years 1971 and 1973 some work was carried out oriented to the restoration, conservation, arrangement and cleaning of the place with the object of transforming it into a site Museum, Center of Studies and Records. 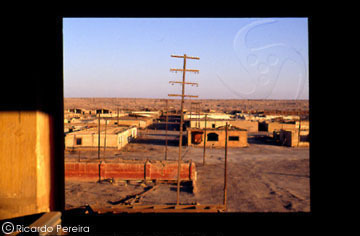 When the Military Coup of September 11, 1973 occurred, the Armed Forces used Oficina Chacabuco as a place for the detention of Prisoners and Political Prisoners' Camp until 1974. 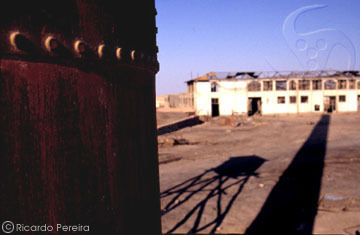 Towards the end of the eighties Chacabuco presented a general state of deterioration; the industrial sector had been dismantled, some roofs and lumber disappeared and the church as burnt down. This situation was partially reverted, thanks to the contribution of the German Government, that, through the Goethe Institute - Inter. 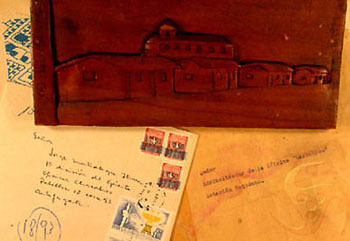 Nations of Santiago and some Chilean institutions, restored the Theater in 1992. Partial view toward the North from the Theater. Although Chacabuco stopped its activities in 1940 its owners maintained it for some years, expecting the reactivation of the industry; however, once this possibility was discarded, towards the year 1945, its dismantling commenced. 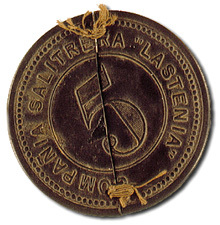 Oficina Salitrera Lastenia. Chacabuco was constructed in the surroundings of this Oficina. It commenced its activities at the end of 1924 and definitively was shut down in 1938. Photo by courtesy Manuel Torres. Theater of Chacabuco at present. It was restored with the auspices of the Goethe Institut - Intern Nationes and some Chilean organizations as part of a broader plan for the restoration and habilitation that today (2003) still has not been complied with. 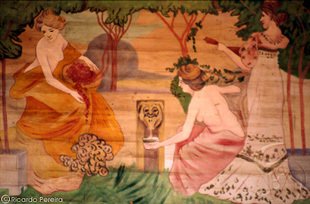 Detail of the Fresco restored at the mouth of Chacabuco Theater. 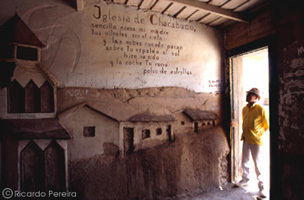 Work carried out inside a workman's house when Chacabuco was a Camp for Political Prisoners (1973-1974). Roberto Zaldivar Varela, watchman and guide of the Oficina observed. 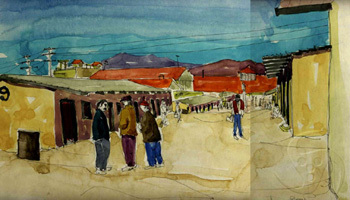 Drawing of Chacabuco made while active, 1974. Courtesy of its author Adam Policzer. Of the cooking stove without an owner. 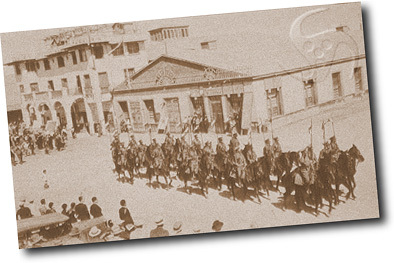 Traditional parade in front of the Theater and Philharmonic Hall of Chacabuco. This Nitrate Company in its period of greatest activity produced 15,000 Metric tons of nitrate monthly and accommodated up to around 5000 inhabitants.